Lunch Box 14: Goat Cheese Stuffed Dates. Yes, Please. Loving my new Paleo Cookbooks!! I had three blissful weeks off. I ate 80% Paleo (but I did consume sugar, which is probably why I gained a good 5 lbs. Boo!). But tomorrow is back to the grind. They have found a new way to torture me this semester – my Wednesdays involve three classes back to back. That’s NINE HOURS of class WITH NO BREAK. I made a few loaves of Paleo bread and froze them and made a double batch of the best spaghetti sauce in the world (a family recipe…I’ll share at a later date). We also received our quarter cow from a local farmer we met at our market this summer. 100% grass fed! And we even went to visit the cows earlier this fall. Very cool. Oh, my favourite part of my three weeks off (aside from the amazing time with my daughter and family) was receiving two new Paleo cookbooks for the holidays! 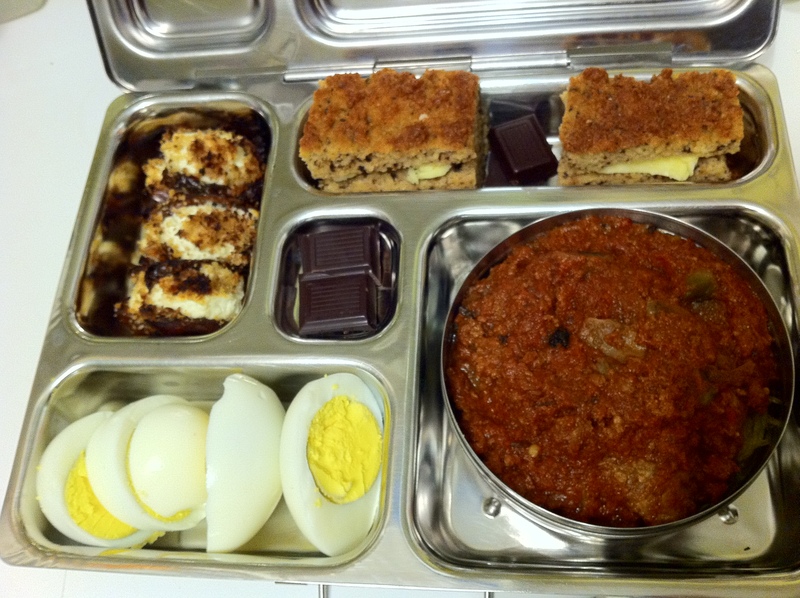 Today’s lunch box includes a recipe I simply couldn’t wait to try from Make it Paleo. I also got Paleo Comfort Foods. What I like about these books is that they are full of creative Paleo recipes, but simple enough that I can confidently pass them over to my husband, who cooks dinner while I’m in school, and know that he’ll be able to figure it out ;). a slight variation on Make It Paleo’s Goat Cheese Stuffed Dates topped with crushed walnuts. Like heaven in my mouth. No, seriously. Two Paleo Bread sandwiches filled with loads of grass-fed butter! Spaghetti squash topped with the World’s Greatest Spaghetti Sauce. I’ve always been an ‘eat the leftover spaghetti & meatballs cold in front of the fridge’ type of girl, so I’m cool with eating my leftovers in class, cold :). Is that weird? And finally, a few squares of Camino brand 80% dark chocolate.